I have not try the real / original cake, but here i bake one, so its just basically a spongy sponge cake, i do not want to condemn much about the test as i have not try the real one yet. 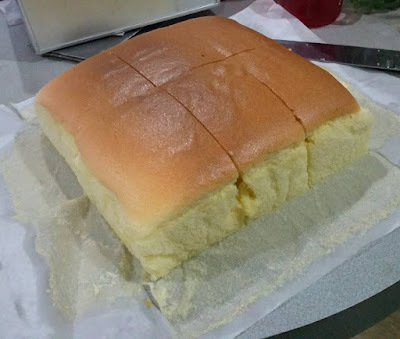 When reading about this cake, people always complain about the long queue for a piece of sponge cake! Now what is it so special? Im curious to know too and thats why i got this recipe today from Steph's Wonder and immediately i try out to see what is all about. 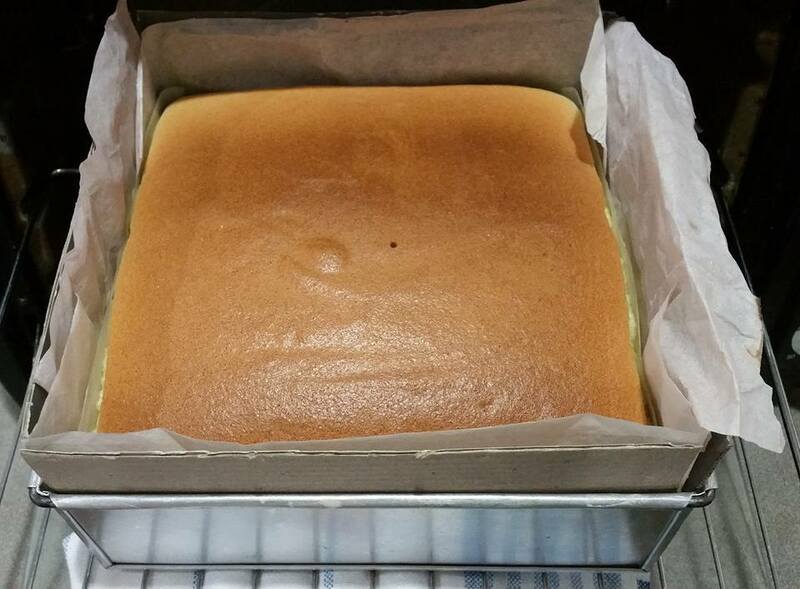 While im baking this cake, i can't wait to see it rise! When its done in one hour, immediately took it out from oven, flip over when it is still piping hot! i do it like how it should be, remove, flip and cut. 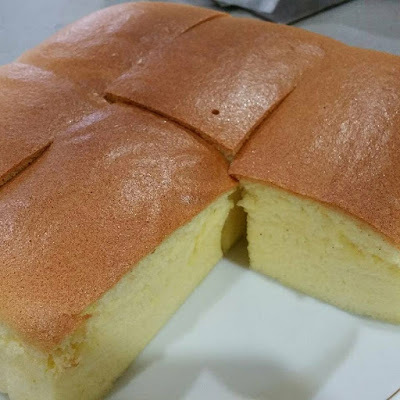 The truth reveal....testing time, Taste...... just like an ordinary sponge cake!!! 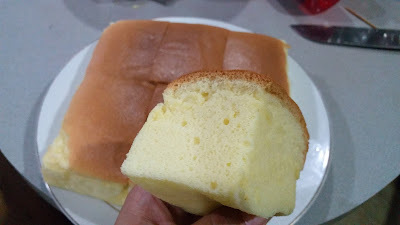 Good.... but just a plain sponge cake.... lol** Anyway, its nice to eat when its warm, I like the texture spongy and basically that's it. I hope my recipe is the right sponge cake that i am looking for. My point of view, maybe many people curious and attracted the way they present the cake when its out from the oven, its steaming hot, a big cake, beautiful fluffy looking cake, they flip, they measure and cut, its kind of a new naked cake show we do not see from any bakery in century, its basically a good presentation and they did break the record of how good the idea is selling their product. 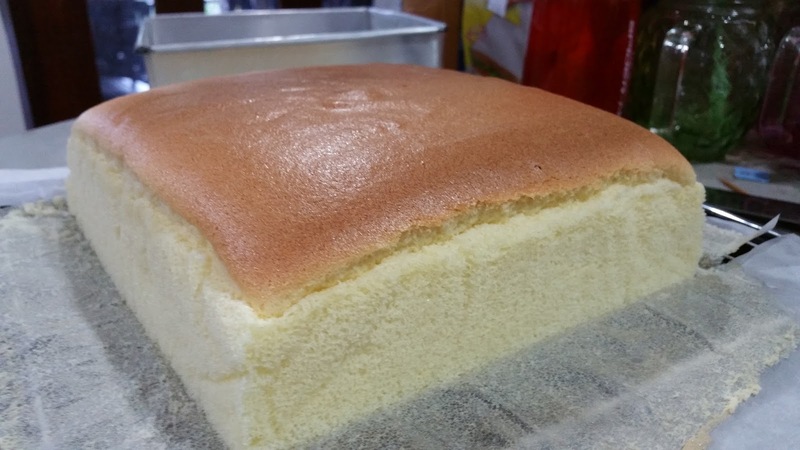 Its kind of impressive for many especially those cake lovers, i think that is all about a sponge cake! 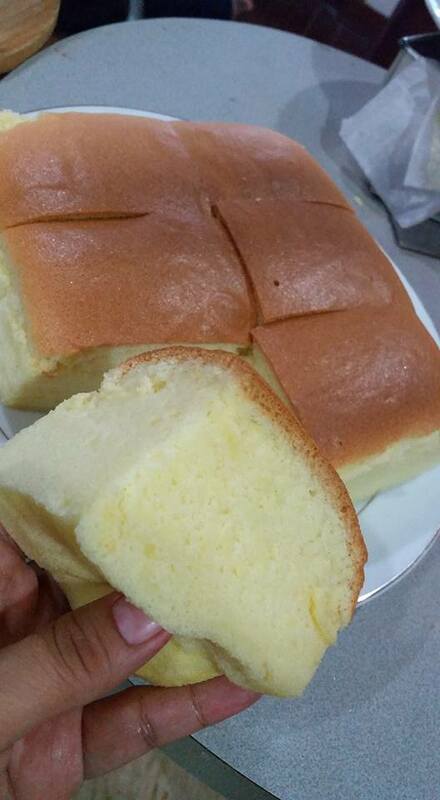 I will try to bake another famous sponge cake with cheese, probably that makes some difference. * 8" square pan, lightly grease with oil side and bottom, line grease paper side and bottom, insert cardboard at 4 side of square pan. * Heat oil in microwave for 2 minutes. or heat with a sauce pan, once it is hot, remove pan from stove. * Mix in sifted flour into hot oil mix well with a balloon whisk. * Add in milk slowly, mix evenly and continue with egg yolks add into mixture, mix until all combine into smooth batter. 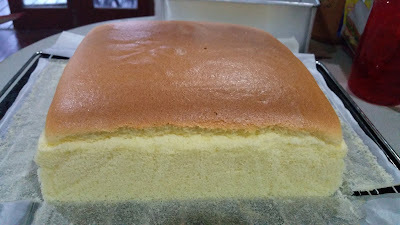 * Beat white and salt and gradually add in sugar until soft to stiff peak. 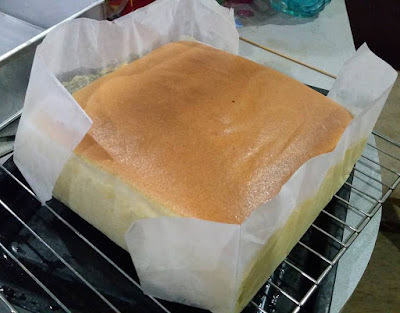 * Add meringue 1/3 meringue into batter with whisk, mix well, fold in 2nd 1/3 portion mix gently and is ok if u see some meringue not totally mix through and fold in the batter into the remaining 1/3 portion of meringue, fold with a spatula gently until all combine. * If you find the finishing result bottom cake is dense, you can remove water, continue bake another 10 minutes "lower oven heat only" with a lower temperature to dry off the cake bottom. * When it is done, remove cake from oven, flip over remove grease paper, and invert cake on clean grease paper or plate. 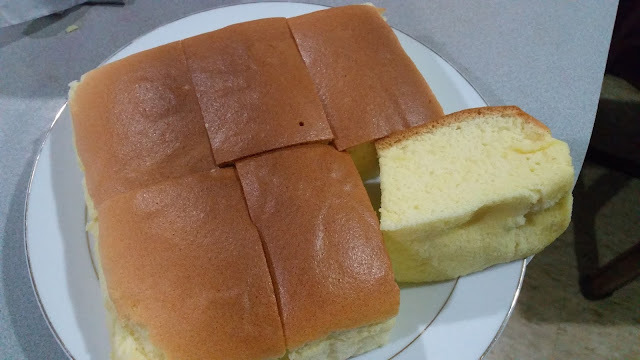 cut cake while its hot and eat warm. It looks really good I think I'd like some strawberries and whipped cream with it too . Thanks for sharing .